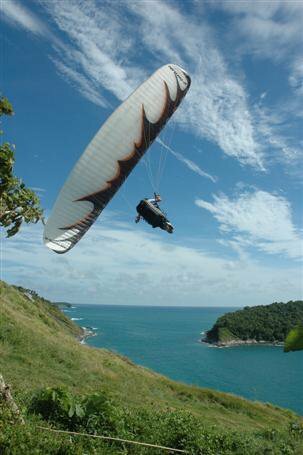 RAWAI, PHUKET: International daredevils are getting ready to throw themselves from the island’s southernmost cliffs as part of Phuket’s first ever ‘Fun Fly’ paragliding festival in May. The festival will take place at Laem Phromthep, Nai Harn Beach, Ya Nui Beach, and Koh Deang, where Phuket’s only wind turbine is located. The death-defying event is the brainchild of Phuket Paragliding Club President Prasert Theplaong, who, when not soaring in the skies, is a practicing dentist with a clinic in front of Bangkok Hospital Phuket. Dr Prasert won the backing of the Phuket Provincial Administration Organization (PPAO), the Tourism Authority of Thailand (TAT) South Region 4 Office, Phuket Provincial Office and Rawai Municipality to hold the event, the first of its kind to be held on the island. This year’s event will run from May 21 to 23. The organizers hope the event will become an annual activity, bringing in tourists during Phuket’s low season for tourism. The festival is expected to draw paragliders from countries including Japan, South Korea, Malaysia, Indonesia, France, the US as well as Thailand. So far 30 foreign paragliders have confirmed their participation in the festival. Some 200 Thai paragliding enthusiasts are also expected to join, said Dr Prasert. Highlights of the festival will include a spot landing demonstration, photo contest and synchronized paragliding show. Anyone wishing to register should contact Dr Prasert (Tel: 076-255336 or 089-4695571).